A 22-year-old soldier with no comorbidities was air-evacuated from height of ~18,000 feet to this center located at 11,500 feet with black discoloration and loss of sensation in a great toe and first two digits of the right foot. The patient was involved in road maintenance activity in the month of December at daytime temperature ranging from ‑2°C to ‑40°C and was having redness of the right foot associated with itching, mild pain and numbness for last 30 days. Patient was a nonsmoker and had no history of regular alcohol intake. He was diagnosed to have chilblains and managed with foot care with lukewarm water (temperature of 37–40°C), aloe-vera gel for local application, pentoxifylline, and ibuprofen. Patient was taking due precaution using dry socks and shoes while working and changing socks twice a day. Then, he felt tingling sensation in his feet and also noticed that the tips of great toe and first two digits of the right foot had blackened/grey appearance. Individual reported to medical officer and was evacuated to our hospital. In our hospital, examination revealed that the patient's involved areas were blackened and hard to touch. 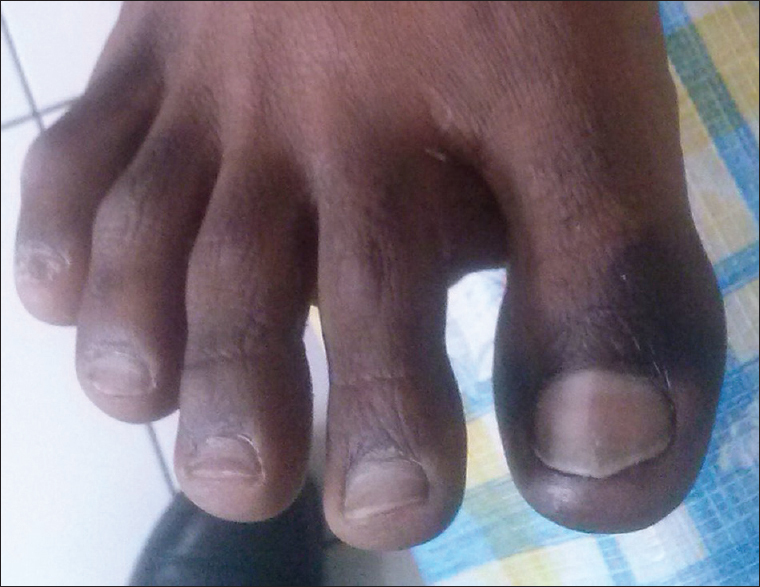 Based on history of cold exposure, symptoms and signs of absence of capillary circulation in affected toes, blackish discoloration and absence of superficial and deep sensation patient was diagnosed to have frostbite-grade-III [Figure 1]. Initially patient was continued on re-warming with lukewarm water, tablet pentoxifylline, and analgesics. With no significant response with supportive care, literature on management of frostbite was reviewed. As per documented benefit of hyper-baric oxygen therapy (HBOT) in various case reports, we thought of early HBOT, which may avoid the amputation in a young soldier. He was started on HBOT (2.0 ATA, total time: 90 min/session, twice/day) along with the continuation of basic medical care. On 5th day of his hyper-baric oxygen (HBO) treatment, the tissue color showed improvement in patches at the tip of great toe. After receiving 20 HBO sessions, and basic medical care over a period of 14 days, the patient had a remarkable recovery [Figure 2]. The patient in this case had genetic susceptibility as he hailed from an area with a tropical climate and presented with the risk factor of prolonged cold exposure as a result of his work demands in road maintenance. These factors in addition to hypoxia at 18,000 feet along with hypothermia due to cold and wind exposure contributed to frostbite. The diagnosis of grade III frostbite was based on clinical findings and severity-based cold injury classification. In the scenario of inadequate response to routine medical management, the patient showed a remarkable response to HBOT showing complete recovery with no requirement of debridement or distal amputation. Frostbite is a cold-induced injury that occurs from exposure to sub-zero temperatures and can lead to potential tissue damage and necrosis resulting debilitating amputations in otherwise healthy people. The use of HBOT for the management of frostbite was first reported in 1963. Till now, HBOT is recommended as a standard of care for the management of frostbite for lack of evidence in randomized controlled trials. HBO is shown to improve the viability of damaged tissue even if delayed  (as in our patient). HBOT has been shown to be of benefit in an isolated case reports., In the case report describing frostbite in an 11 years boy with third degree frostbite (as in our patient) in fingers of both hands HBOT for 14 days resulted in complete recovery without affecting the epiphysis. The possible mechanisms by which HBOT is likely to benefit in frostbite is reduced reperfusion injury possibly due to reduced endothelial adherence of neutrophils by b2 integrins ,,, and improved microvascular endothelial oxidative stress resistance, cell proliferation and tube formation. Microvascular compromise and reperfusion injury are important mechanisms involved in the pathophysiology of frostbite. Better endothelial oxidative stress resistance contributes to better microvascular recovery and salvage of damaged tissue. In addition to these benefits, HBOT does affect the antibacterial functions of neutrophils , this promotes effective healing even in cases of infections. Thus, the effectiveness of HBOT in cases of frostbite needs to be better assessed in larger numbers. Frostbite is a condition common in physically active individuals venturing in areas of extreme cold for occupational or recreational activities. The condition is associated with considerable morbidity especially postamputation in otherwise a young and productive population. Hyperbaric oxygen therapy can be considered as an effective adjunct to mainstay therapy in cases of frostbite to minimize posttreatment sequelae. Mills WJ. Clinical Aspects of Frostbite Injury. In Proceedings of the Symposium on Arctic Biology and Medicine. IV, Frostbite. Fort Wainwright, Alaska: Arctic Aeromedical Laboratory; 1964. Ledingham IM. Some clinical and experimental applications of high pressure oxygen. Proc R Soc Med 1963;56:999-1002. McIntosh SE, Hamonko M, Freer L, Grissom CK, Auerbach PS, Rodway GW, et al. Wilderness Medical Society practice guidelines for the prevention and treatment of frostbite. Wilderness Environ Med 2011;22:156-66. Kemper TC, de Jong VM, Anema HA, van den Brink A, van Hulst RA. Frostbite of both first digits of the foot treated with delayed hyperbaric oxygen: A case report and review of literature. Undersea Hyperb Med 2014;41:65-70.
von Heimburg D, Noah EM, Sieckmann UP, Pallua N. Hyperbaric oxygen treatment in deep frostbite of both hands in a boy. Burns 2001;27:404-8. Folio LR, Arkin K, Butler WP. Frostbite in a mountain climber treated with hyperbaric oxygen: Case report. Mil Med 2007;172:560-3. Godman CA, Chheda KP, Hightower LE, Perdrizet G, Shin DG, Giardina C. Hyperbaric oxygen induces a cytoprotective and angiogenic response in human microvascular endothelial cells. Cell Stress Chaperones 2010;15:431-42. Grieve AW, Davis P, Dhillon S, Richards P, Hillebrandt D, Imray CH. A clinical review of the management of frostbite. J R Army Med Corps 2011;157:73-8. Jüttner B, Scheinichen D, Bartsch S, Heine J, Ruschulte H, Elsner HA, et al. Lack of toxic side effects in neutrophils following hyperbaric oxygen. Undersea Hyperb Med 2003;30:305-11. Thom SR, Mendiguren I, Hardy K, Bolotin T, Fisher D, Nebolon M, et al. Inhibition of human neutrophil beta2-integrin-dependent adherence by hyperbaric O2. Am J Physiol 1997;272:C770-7.